Freaks (M-G-M, 1932), featuring Olga Baclanova, Henry Victor, Harry Earles, Daisy Earles, Wallace Ford, and Leila Hyams. Directed by Tod Browning. Early talking feature, black and white, 62 minutes. Re-released on DVD by Warner Home Video, 2004. The film has yet to receive a Blu-ray release. 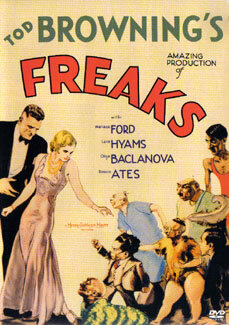 In 2004, Warner Brothers released Olga Baclanova’s most famous movie, Freaks, on DVD. Many mainline DVD’s released today seem to be put together by people who could care less about the movies they are rereleasing, but fortunately, the 2004 Freaks DVD reissue does not fall prey to this fate. Warner Brothers have instead delivered a DVD that truly does the movie justice. The DVD features a crisp transfer of the film and bevy of well-researched supplementary material. 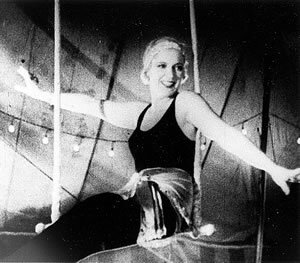 Olga Baclanova's opening shot as the "Peacock of the Air" in Freaks. When one considers that this film was very close to being a lost film at one point and that the existing prints come from 1940’s/50’s Dwain Esper exploitation prints, it is really quite amazing that the existing print looks as good as it does. The existing transfer, which has been shown repeatedly on Turner Classic Movies, seems to be the one used here, and other than a few speckles and maybe one or two instances of a slight splotch of fading at the end of a reel it looks maybe forty years old rather than seventy-five from a quality standpoint. There is only one exception to this, and that is the addition of the only found additional footage, which has been added back into the film. This footage is of Hans at his estate, when his friends Phroso and Venus interrupt his reclusive existence by reintroducing him to his old flame Frieda. This found footage wasprobably added back into the film in the 1980’s and comes from a 16mm source, so there is an obvious difference in the clarity of this footage compared to the rest of the film, which is from 35mm sources. But the DVD version even takes the time to improve upon this. In the VHS release of the film, the 35mm cuts abruptly when the spieler/barker introduces Olga as the Duck Girl, and goes directly into 16mm footage of the Duck Girl, which dissolves into the found Hans estate footage. In the DVD version of the film, they use a 35mm clip of the duck girl footage and edit it out a little early into the 16mm footage of Hans in his study, which is edited into a little late so as to avoid conflict with the original 16mm’s fade-in, but not noticeably so. The VHS version’s cut into the 16mm actually distracts from the blunt punch the film intended in unveiling the Duck Girl because you tend to notice the difference in picture quality at first and then focus back in on the Duck Girl, but with the Duck Girl footage re-added in 35mm, the intended effect is preserved, even if the Duck Girl footage is slightly grainy. But before you bemoan the missing frames in this new edit, you will be happy to know that the 16mm cut as seen on the VHS is one of three surviving alternate endings that appear in their entirety as part of the supplementary material. These endings are the only alternate footage from Freaks that has survived, and Warners were kind enough to add it all here. The footage contains commentary from Tod Browning biographer David Skal (who also narrated the movie’s audio commentary and appears throughout the Freaks: Sideshow Cinema documentary) that explains the endings in the three prints, followed by the endings themselves, all starting with the unveiling of the Duck Girl. The first ending is the complete ending of Hans at his estate as it survives in 16mm, the second includes a later silent 35mm edit of the estate footage, and the final version is solely of the unveiling of the duck girl. Each is presented as it originally appeared, complete with the ending credits. Lastly, as mentioned before, the surviving 35mm prints of Freaks come from Dwain Esper exploitation prints, which include a scrolling prologue at the beginning of the film that essentially expounds on the spieler’s “offend one and you offend them all” commentary. For this version, the Dwain Esper prologue was cut from the film and offered under a separate menu entity in the film’s main menu just before the movie itself. This is again a step forward toward preserving the original continuity of the film, which now goes into Leo the Lion’s famous roar. I used to fast forward through the prologue on the VHS version all of the time, and now thanks to the loving work Warners did in this DVD the prologue is still available but is no longer a distraction. About the Documentary "Freaks: Sideshow Cinema"
This good treatment continues in the added documentary Freaks: Sideshow Cinema. At 63 minutes long, this “featurettte” is actually one minute longer than the movie itself. It contains no narration and is edited from interviews with David Skal, author and narrator of the audio commentary; Tod Robbins and Johnny Meah, both sideshow performers and historians; Mark Povinelli, midget actor; Jerry Maren, midget actor famous as a member of The Lollipop Guild in The Wizard of Oz; and Jennifer Miller, a living bearded lady and sideshow performer. The film is divided into no less than eighteen subsections that look at just about every conceivable facet of the film. 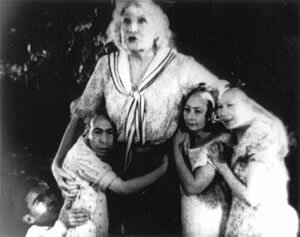 Each of the freaks gets their own subsection in the documentary and a thorough presentation in stills and in discussion of their lives. The sections on Harry and Daisy Earles and on Daisy and Violet Hilton are particularly enlightening, as we are treated to numerous rare photos of them and learn about their successes in vaudeville and in the sideshow. As the sections on the freaks flash before you and you learn more about them, you find yourself fascinated and absolutely in love with the colorful cast of characters in the film in a way that you never would be with any other film; you find yourself becoming the freaks’ fans and wanting to see and know even more about them. Madame Tetrallini and the pinheads, er, I mean, microcephalics. Although the interviewees are pretty good about relating the history and spirit of the sideshow and not letting their personal views get in the way, they do manage to revel in politically correct terms for the sideshow characters, which gives some extra comic value to the DVD. Listen and laugh as the interviewees get PC to ridiculous proportions when talking about the freaks. Hermaphrodites are not hermaphrodites, they’re “intersexed persons”, pinheads are not pinheads, they’re microcephalics, midgets are not midgets, they’re “little people” (aren’t children little people too? ), and barkers are not barkers, they’re “outside talkers” (whatever happened to “spielers”?) Why didn’t they think to come up with a PC term for “freaks” while they were at it? The PC renaming quickly degenrates into a pitiful attempt at eliciting compassion on the freaks we have fallen in love with already. Not to mention it’s quite funny to watch the interviewees betray their own attempts at being PC when they use words like “deformed” and “normals”. The commentary on this film is provided by David Skal, author of a biography on Tod Browning called Dark Carnival: The Secret World of Tod Browning, Hollywood’s Master of the Macabre. The narration sounds like an audio documentary or a radio show, and is well thought out and well synchronized with the movie. Included in the commentary are many excellent tidbits of information on the film, including discussion of the cut portions of the film, biographical info on Tod Browning and a detailed look at his film career, readings of many of the reviews of Freaks from the period, and discussion of Freaks’ influence on later movies and pop culture in general. The commentary reveals something rather shocking in that it spends much time praising silent films, even to the point of holding them in slightly higher esteem than early talking pictures. The commentary and the documentary obsess about silent movies quite a bit, a more notable example being when David Skal gives a complete and detailed rundown of Tod Browning’s silent career at MGM, including brief summaries of each film’s content. 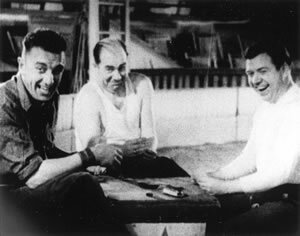 Lon Chaney is mentioned quite often, due in large part to his frequent collaborations with Browning. Skal talks in depth about Tod Browning’s filming the wedding feast scene in a silent manner, and refers to it as his “last hurrah” as a primarily silent director in the face of Hollywood’s “obsess[ion] with the new technological toy of talking pictures.” Although this is a little speculative and probably should be taken with a grain of salt, it is still interesting and surprising to hear such a blatant defense of silent pictures, which is something that would have been unheard of even 20 years ago in a mainline video release. Olga Baclanova in her kimono. Contemporary cultural cues led 1930's audiences to instantly recognize the kimono as tramp clothing, just as we would consider a latex mini skirt to be tramp clothing today. But the commentary is not without its flaws. One in particular is a misunderstanding of the culture of the period. When Olga lures Henry Victor into her lair, you may remember that she puts on a kimono and says to Victor, “Ah—come on in!” Skal notes that “In the pre-code days, just wearing a kimono on screen might be ample evidence of moral turpitude.” This is said in a way that would lead people listening to the commentary to scoff at the “ignorance” of those days. But if you were watching Freaks when it was first released, you would have known that kimonos were common overwear for prostitutes in brothels, and this was because a kimono was, shall we say, an easy package to unwrap. There is a silent movie from 1920 called The Red Kimona about a girl who is forced into prostitution that would give a modern-day movie watcher more insight into this now nonexistent cultural reference. Another error is a factual error about Olga’s filmography. The commentary says that after Freaks, Olga would only appear in two more features. The correct information is that she would appear in three features and three short films. Probably the worst thing about this entire disc is the English subtitles, which is really nice to be able to say about a mainline DVD release, considering the glut of poor transfers, terrible commentaries, and superfluous featurettes that mar many classic film DVD releases like graffiti on classic architecture. From watching the film with the English subtitles, it appears that the subtitle creators were not familiar with the film and tried to transpose the film phonetically without consorting to the film’s original cutting continuity. Almost none of the lines that appear in foreign languages are in the subtitles, and there are major errors and omissions in the subtitles that confuse the plot or add unintentional cheeseball humor to the release. Now for the English flubs. There are a lot of small ones that are inconsequential, but there are also important ones that could have been corrected had they referred back to the original cutting continuity, as we will do here. What have you on your shoulders for heads? Swill pails? Or Swiss cheese? Another good one is in the wedding feast, when Hercules shouts to Cleo, “They are going to make you one of them, by peacock!” The subtitles translate this as, “They are going to make you one of them, by big luck!” And yet another subtitle translates Olga Baclanova’s heavy Russian accent literally. When she calls Hans a dwarf, the subtitles say “dwarp”—twice in a row! Also, when Hans reacts to Cleo’s and Hercules’ attempts to convince him that their treatment of him at the wedding feast was a joke, Hans says, “Hans—the fool! Through the divorce courts—they’ll laugh!” The subtitles read, “Tell the divorce court. They’ll laugh,” which misses the point of the extended purgatory that Hans expects in his near future. There are too many minor problems to discuss here, but other missed words include “coaxed” not “caught” when Cleo lures Hercules into her wagon, “slugs” not “thugs” when Phroso chews Venus out after she leaves Hercules, and “better, better,” not “farther, farther,” when Hans rubs Cleo’s shoulder. But the biggest subtitle crime of all appears during the wedding feast. The most memorable line in the entire film—“Gooble Gobble”—does not appear at all in the subtitles. No kidding. But other than the subtitles, we can’t recommend this DVD release more. One last credit to the DVD that is especially important to Olga Baclanova fans: whenever her name is mentioned in this DVD, it is pronounced correctly (bahk-LAH-no-vah), unlike the incorrent pronunciation of back-luh-NO-vuh on the Kino re-release of The Man Who Laughs. Hooray for good scholarship!